John Kingsley (pictured) is the LVEDC Vice President of Finance. The finance department provided access to $17.2 million in funding for 11 regional companies or organizations in 2017, supporting $54.6 million in investment in the Lehigh Valley. This led to the creation of 417 jobs and the retention of 393 existing jobs. It was another successful year for the LVEDC Finance Department, which provided access to $17.2 million in funding for nearly a dozen regional companies or organizations in 2017. 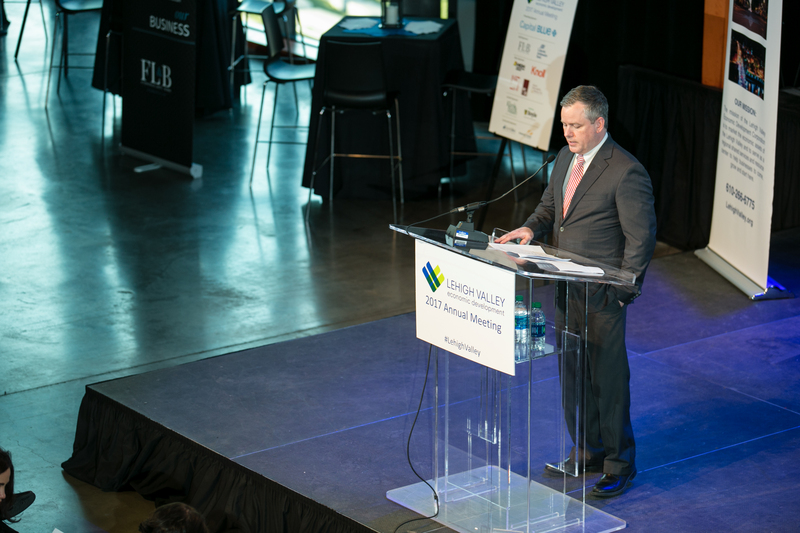 That financing support a total of $54.6 million in investment in the Lehigh Valley, and helped lead to the creation of 417 jobs and the retention of 393 more existing jobs within the region, according to LVEDC Vice President of Finance John Kingsley. “Our staff provides access to a wide variety of financing options, as well as a consultative approach to advising companies, not only on the resources we administered directly, but on a myriad of options available through traditional lenders and other public and non-profit resources, to maximize the benefit to our customers,” Kingsley said. The organization’s single biggest financing project from 2017 was $3.94 million that the Green Knights Economic Development Corporation received for the redevelopment of the former tire recycling facility in Wind Gap. The financing was secured through the state’s Business in Our Sites program. LVEDC wrote the economic feasibility study that served as a central component in the financing application, and also helped get state legislators engaged with the project, Kingsley said. LVEDC’s Finance Department provides much-needed capital for companies looking to relocate, expand, or start in the region, offering access to multiple financing options and loan programs to address an array of business needs. This includes access to low fixed-rate financing through Pennsylvania Industrial Development Authority (PIDA), considered by many lenders to be Pennsylvania’s flagship economic development lending program. PIDA reduced the interest rate on its primary real estate and machinery and equipment financing program to historically low amounts last year. The program is one of several incentive financing resources available through LVEDC via the Lehigh Valley Lending Network. Click the image above to enlarge and see all 11 projects supported by the LVEDC Finance Department in 2017. LVEDC provided access to $17.2 million in funding for 11 regional companies or organizations in 2017. The network, which is administered by LVEDC, offers a single point of entry to 16 local banks and lending institutions and more than 30 local, state and federal business financing & incentive resources to eligible companies in our region. “Through one inquiry, we can help you access loans with low fixed interest rates, tax credits and grants to help your business expand and your project succeed,” Kingsley said. Among the companies assisted in 2017 was Consolidated Storage Companies, a leading manufacturer of industrial and commercial storage products. LVEDC helped the company obtain $2.2 million in financing for the acquisition of the company’s building in Tatamy. Another is Royal Industries, a manufacturer of promotional products, which received a $1.8 million PIDA loan through the Lehigh Valley Lending Network. That financing helped the company relocate from New York City to an 85,000 square-foot facility in Allentown, creating 80 new jobs over the next three years. Moving ahead, this year will mark the merging of the Northampton County New Jobs Corp and the Lehigh County-based Lehigh’s Economic Advancement Project (LEAP) into a single entity, the Lehigh Valley Economic Investment Corporation (LVEIC), Kingsley said. Previously, LVEDC worked with each of the two county-based organizations with the administration of its financing programs. Now, the newly-merged LVEIC will take a collaborative, regionally-focused approach to not only handle economic development financing for the counties, but also to discuss economic development strategies and how to promote them. Among other companies assisted by the LVEDC Finance Department in 2017 was Campbell and Strasser, a producer of architectural woodwork and cabinetry, which is relocating from a 3,700 square-foot location in Bath to a 15,000 square-foot warehouse in Fountain Hill. Additionally, Vastex International, Inc., a family-owned manufacturer screen-printing equipment for the garment textile industry, broke ground in May 2017 on a new facility in Bethlehem, a project that received significant assistance from LVEDC’s Finance Department. LVEDC also helped provide financing assistance for RB Collection, a premier restoration shop and dealership, which held a groundbreaking ceremony last month for an auto restoration, showroom and luxury apartment project adjacent to the America on Wheels museum.